I apologize for the racket. I’m making a little more noise than usual as I walk around today. for the Armor of God. Know what I’m talking about? Read it here from Ephesians. Yep. So I’ve got my great big Belt of Truth on. It’s got a gigantic buckle with a dove on it. Very disco, if you ask me. Next, I’ve got some huge clunking gospel boots for some all-terrain Peace making. Oh, and don’t forget my shield. I’ve never actually tried to intercept a flaming arrow before, but I can attest that this shield of Faith is heavy duty. Then I’ve got my classy helmet of Salvation, decorated in rhinestones and cubic zirconia. And last but not least, my sword of the Spirit. It’s not really very sharp, but it gleams a brilliant white light. Do you know how many thrift stores and Renaissance festivals I had to go to get all this stuff? To be honest, it’s hard for me to even type out this devotion, with all the gear I’m carrying today. Actually, I seem to be chafing a little bit. Upon further reading, I think this passage is supposed to be a metaphor. In other words, we can carry Truth, Peace, Righteousness, Faith and Spirit with us, all with no hindrance. 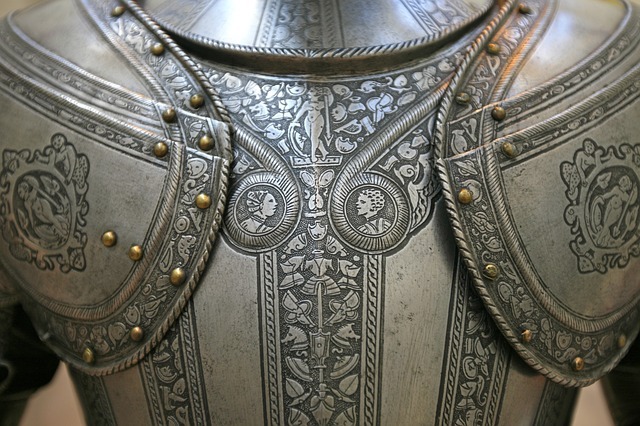 Just because the Armor of God isn’t made out of metal, that doesn’t mean it’s not there. 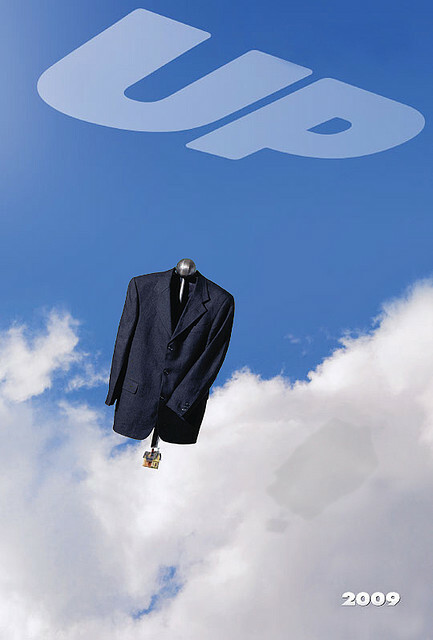 Each morning when you get dressed, it can be a part of your wardrobe. Can you imagine the benefits? All you have to do is pay attention to what you’re putting on. What kind of sadist would enjoy watching people teeter on the edge of collapse at any second? What sort of sick individual wants to see people fail publicly and dramatically? Truthfully, I’m the type to move into another room when figure skating comes on. Not because I’m a sports snob — but because I get too nervous. Why? Think about it: Everybody who figure skates, from the kid taking their first lesson to the Olympic hero with everything on the line — Everybody who figure skates falls down. EVERYBODY FALLS. Even the best of the best. 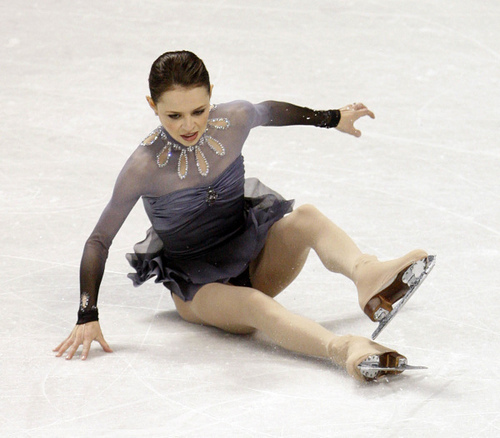 There has never been a figure skater who has not bit the dust (ice) on numerous occasions. That’s why I’ve hated watching it for most of my adult life. I don’t want to see that! But recently, I’ve had a change of heart. Maybe I’ve been looking at it all wrong. Maybe ice skating is like Christianity. In Christianity, as in skating, everybody falls from time to time. Even the best of the best. It doesn’t matter if you’ve been a Christian for five minutes or for fifty years — you’re still gonna slip up somewhere along the way. The thing is, if you look only at a person’s sins, you’ll have overlooked some of the incredible feats of faith they might have accomplished. Instead of looking at Christianity, you’d just be looking at Sin. If you treat the falls as if they were center stage in a person’s life, you could lose your appreciation for the triumphs — the triple axles of faith, that mark the great moments of our lives. I think I’m ready to give figure skating another try. I’m starting to figure out that a spill on the ice is not the catastrophic embarrassment I’ve made it out to be. It’s just a slippery patch along the way to Glory!